GeekTonic: New Mac Mini with NVidia Graphics & More Power - HTPC Ready? New Mac Mini with NVidia Graphics & More Power - HTPC Ready? It seems Apple decided to forgo the big event-style announcement today and instead went the traditional, press release route. Mostly newer, upgraded hardware was included in the announcement, but for HTPC enthusiasts, the new Mac Mini will likely catch your eye the most. This new version of Apple's Mac mini desktop computer features faster graphics, faster memory and other enhancements, but still priced starting at $600 for the 120GB version and $799 for the 320GB version. The size of the new Mac mini is still 6.5 x 6.5 x 2 inches. The rear of the Mini shows two video interfaces, a Mini DisplayPort and a mini-DVI connector. The Mini has five USB 2.0 interfaces (older generation had three), a FireWire 800 jack (older version had FireWire 400). Also included is Gigabit Ethernet, audio line in and audio line out ports. More importantly is the specs inside this little box. Both Mac mini models have 2.0GHz Intel Core 2 Duo processors with 3MB shared L2 cache AND include Nvidia GeForce 9400M integrated graphics. Finally, the new Mini's include 8x slot-loading “SuperDrives” for viewing & burning DVD media and AirPort Extreme wireless networking and Bluetooth 2.1+EDR built in. Not to shabby for a little Apple device. The $800 Mac Mini has 2GB of 1066MHz DDR3 SDRAM & the 320GB SATA hard drive. The $600 Mac Mini has 1GB of 1066MHz DDR3 SDRAM & a smaller 120GB SATA hard drive. You can pay more and have it built-to-order with additional options like a 2.26GHz Intel Core 2 Duo processor, more memory, larger hard drives etc. Will it work as an HTPC? 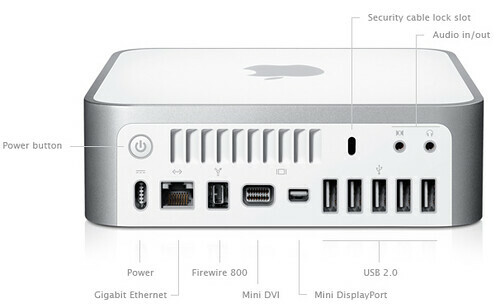 I think the Mac Mini would definitely work as an HTPC - well at least an HTPC extender. It wouldn't be the cheapest HTPC box you could get, but it looks powerful enough to handle HD HTPC chores and definitely small enough to blend with the livingroom environment. What's missing? Well, the Mac Mini doesn't come with an Apple remote (costs another $19 for that), HDMI is nowhere to be found and no built-in tuner brings down the full-blown HTPC cred a bit although a SiliconDust HDHR could take care of that problem. It would also be nice to see a Blu-ray optical drive option also. I personally prefer the server/extender type setup, but the Mac Mini looks like a definite competitor for the small, powerful HTPC device for near the TV. SageTV, Boxee, XBMC, FrontRow, Plex, Elgato and other Mac-capable HTPC software take note!